I actually got to take a shower and shave!!! Believe it or not the tortilla chips afforded me the peace of mind to get in the shower during her Novolog. I’d never get a shower during the 3 hour cycle of the Novolog normally. The Bag... Cole has a dentist appointment in 45 minutes so I have to “pack the bag”. Those words you hear in our house every time we go out. “Did you pack the bag”... “Let’s go, I packed the bag”... “is the bag packed we have to go”. That bag is omnipresent. 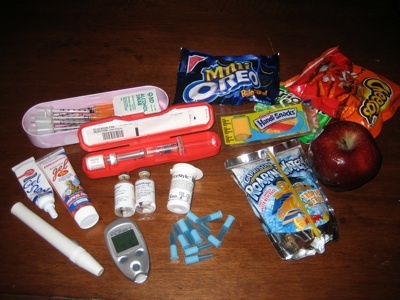 The bag has Arden’s meter, test strips, lancets, the lance, Novolog, Levemir, at least 10 syringes, alcohol wipes, an emergency glucagon kit (wait till you find out what that is), fast acting glucose, glucose tabs, chips, cookies, candy, juice, & gum. BG Check... It’s 12:30 pm, time to test her BG again. Even if it wasn’t time I wouldn’t leave the house without knowing what it was. So after all of that Arden’s BG is 236 three hours later. Not good but not bad considering she had waffles and snacked just 30 minutes ago. We have to leave for the dentist now. The appointment is at 1 pm and will be over before 2 pm. We’ll have lunch immediately after that. So I’m probably going to give Arden a half of a unit of Novolog at the dentist office (I’ll test her there again). She’ll probably be lower by then even though the makers of Levemir say it doesn’t drag BG down but keeps it stable. However, that just isn’t our finding. You’ll see a good example of that tonight. To Do... So dentist in 30 minutes, lunch, Arden has a haircut at 4:30 and we need to replace those yucky bananas she talked about on the video. I need to get these things done and be home making dinner by 6 pm at the latest. I don’t want to give Arden a Novolog shot much later then that or I’ll be up all night waiting for it to peak. Got to go!